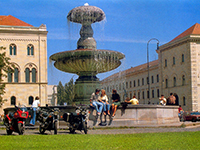 The Ludwig Maximilian University of Munich (LMU) in the south of Germany is one of the leading research universities in Europe with a more than 500-year-long tradition. The university’s 18 faculties offer a wide and well-differentiated spectrum that covers all areas of knowledge, whether humanities and cultural sciences, law, economics and sociology, or medicine and the sciences. Some 700 professors and 3,300 academic staff members do research and teach to 44,000 students, of which 15% come from abroad (Wikipedia). Responsible for MEME at the LMU is the Munich Graduate School for Evolution, Ecology and Systematics (EESLMU). EESLMU is a collaboration between the Biology Department, the Department of Earth- & Environmental Sciences of the LMU, the Max Planck Institute for Ornithology and the Bavarian Natural History Collections. The collaboration between these institutions provide a particularly broad scope and encompass a large number of centers of excellence and expertise. The local MEME coordinator at the Ludwig-Maximilians-University Munich is Prof. John Parsch.